EAST MARLBOROUGH — In our new Unionville Times feature, ”Top of the Tribe”, we will be highlighting a worthy student for his/ her accomplishments in the classroom as well as their exploits on an athletic, academic, dramatic or musical stage. Our new bi-weekly feature will help you get to know the person behind, the mask, music or statistics and hopefully will be something that our readers will look forward to seeing. Please fell free to comment or let us know about a Kennett student that warrants a Top of the Tribe profile on them as we thrive on reader feedback to continue to grow and improve our coverage of the Unionville school district. 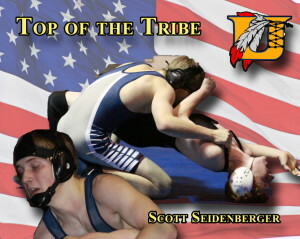 At first glance Indians senior Scott Seidenberger appears to be a typical teenager, being certain to maintain his social network status, as he is the captain of the varsity wrestling team, while fulfilling his demanding schedule as he navigates his way through the halls of Unionville High School. Seidenberger is anything but typical, at age 18 the Kennett Square native, who has committed to Cornell and will be attending on a full ROTC scholarship from the state department, traveled to and spent an entire summer in Russia and helped lead his beloved Indians into the district playoffs on the mat last season and has high aspirations for his senior year. Seidenberger, who is not only the senior class president and sits on the school board as the student representative, also takes time to help in events and activities in the community as well, as he prepares for a career in labor relations. Who has inspired you or been the biggest influence on you? When you’re not trying to burry a Ches-Mont opponent into the mat, what hobbies do you have? If we tapped into your I-Pod before a match or when you are just relaxing what kind of music would we hear? If you could play a round of golf or just have a lunch in the city what three people would you invite and want to spend time with? Congratulations to a well deserving young man! !